Wildflowers INK is here! Create beautiful marbles, and vivid color splashes and background art using Wildflowers INK. 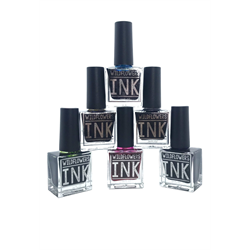 Our INK is made with cosmetic approved pigments, so it's safe for you and your clients. Wildflowers INK can be used on either a shiny (tack-free) surface, or matte surface. Apply Wildflowers INK to the nail surface. Use acetone to completely disburse the pigments, or use Isopropyl Alcohol to gently feather them. 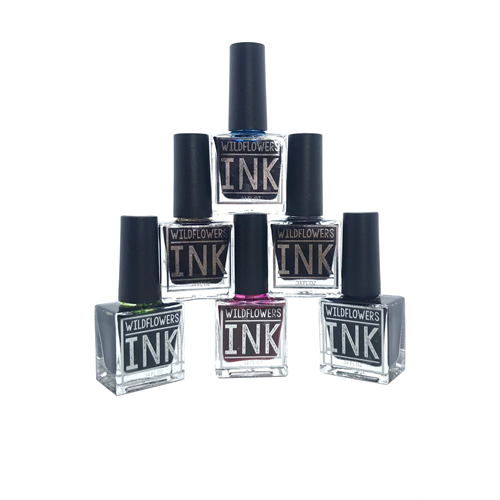 Once INK has dried completely, topcoat with Wildflowers Top Coat Gel or Wildflowers Metallic Topcoat. If you'd like a MATTE finish, be sure to topcoat FIRST with Wildflowers Top Coat Gel or Wildflowers Metallic Topcoat, then finish with Wildflowers Matte Topcoat. Each ink set contains THREE Wildflowers INKs. Each INK is .34fl oz.